Do you ever have a wine varietal which you just can’t seem to find much within the bottle that you enjoy? Tasting with other wine professionals and novices alike I think everyone has at least one. I feel that it is important to see a wine for what it is and what the winery or winemaker is trying to achieve with each individual style, but that doesn’t mean that I will like it. However, for me, the one varietal that I can't seem to pallet has been Zinfandel. The alcohols can seem intrusive up in to the 16% level. The wines have so much juicy extraction with flavors of prunes, and sweet baked fruit. For this reason when I was given my Zinfandel assignment I held off for as long as possible. On the upside I did see that the bottle was from Maroon Winery and I have always appreciated the classic nature of their Chardonnay and Cabernet Sauvignon. I thought to myself, would this Reserve Old Vine Zin be one that I can truly enjoy and welcome with open arms? To my pleasant surprise the alcohol was in check at a modest 14.5%, the color was gleaming and translucent, and the nose had a pleasant balance of toasty oak and dark briery fruit. After all the time I have spent knocking Zinfandel, maybe I have not given this wine enough promise as of late. This wine was impressive in balance that boasts nice acidity and a more refined complex flavors then the other versions I tried in the past. The wine had great finesse and led to an evening of rack of lamb, which I believed would be the perfect pairing. Wow! 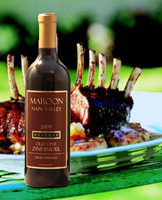 Not kidding, when you order this wine venture down to the local butcher and grab a rack… of Lamb. I make a relatively simple lamb especially when the butcher French cuts the lamb. Just rub it with salt and pepper, pan sear it browning each side, then rub it with minced garlic and Dijon mustard, put it in the oven for about 12 – 15 minutes at 450 degrees and then eat delicious medium rare lamb. Serve with a little caramelized onion chutney and a glass (or bottle) of Maroon Reserve Old Vine Zinfandel for full enjoyment. I had given up on Zin and this was my own fault, as I gave up too soon. I probably have tried less than ten Zinfandel over the past 7 years and this mainly coming from my naive youth in the wine industry. I was trying what could be seen as the wrong zins as many were from those main stream brands and not these lesser known, small production, and handcrafted wineries. Not only will I give Zinfandel another chance, but maybe I will try to get over my paranoia of Viogner as well. So thank you Maroon for opening my eyes. feel that it's far important to look a wine for what it's far and what the vineyard or winemaker is making an attempt to acquire with every character fashion, however that doesn’t imply that i'm able to like it. however, for me, the only varietal that I cannot seem to pallet has been Zinfandel. The alcohols can appear intrusive up in to the 16% stage. The wines have so much juicy extraction with flavors of prunes, and sweet baked fruit. for that reason whilst i was given my Zinfandel assignment I held off for so long as feasible. Generally I do not learn article on blogs, however I would like to say that this write-up very compelled me to check out and do it! Your writing taste has been surprised me. Thank you, very nice article. You know so much its almost tough to argue with you (not that I really would want to?HaHa). You certainly put a fresh spin on a subject that's been discussed for years. Wonderful stuff, just wonderful! There's no alternate way to get around that procedure, and it ordinarily takes a while once the embed is put into your jawbone. I am very happy to read this article..thanks for giving us nice info.Fantastic walk-through. I appreciate this post.Travel "Write for us"
Extraordinary information and new data in your site. You have some extraordinary posts in your blog. I will visit yet again. magnificent posts in your blog. Remain mindful of the colossal work. I to a great degree thankful to you for this phenomenal read!! You finished an amazingly exceptional movement, keep it up. An obligation of appreciation is all together for that fundamental information, its to a great degree strong. I am totally awed with Dermessence and genuinely regret misusing my chance on home cures which sets aside a long opportunity to give comes to fruition. Home cures work, yet step by step and for some circumstance they essentially keep developing signs from becoming further, yet don't oust them completely. Robert Parker has for quite a while been my wine controlling light. In this manner I was particularly fulfilled that he agreed with me on the qualities of your 2010 cabernets. Continue doing marvelous. Likewise, the blog was uncommonly exquisitely created. Lovely getting the hang of grabbing article. This post is to a great degree the best on this gainful subject. Thankful for the illuminating and steady post, unmistakably in your blog everything is awesome.. I don't consider various destinations give this kind of information. This is such a smooth idea! I figure this club would be a surprising idea! We really need to take a gander at this. OK getting the hang of grabbing article. This post is amazingly the best on this noteworthy point. expected to leave a little comment to help you and wish you an OK continuation. I'm gone to tell my younger sibling, that he ought to likewise go to see this site on customary premise to get refreshed from latest reports. Howdy would you mind letting me know which web host you're working with? I've loaded your blog in 3 completely different browsers and I must say this blog loads a lot quicker then most. Can you recommend a good hosting provider at a reasonable price? Kudos, I appreciate it! I would like to bookmark the page so I can come here again to read you, as you have done a wonderful and sublime job. Another problem when you deploy printers using group policy in Windows Server 2012 R2 is that the default options can be limited and don't always "stick". With Printer, setting the default options—including such variables as duplex, paper type, color settings and dpi—can be as simple as ticking a check box. When you implement Printer, you don't just get to eliminate GPOs. You can also eliminate your print servers completely and replace them all with one server running a single instance of Printer—or without any physical server at all using our new SaaS solution, Printer Cloud. To put it another way, you won't have to worry about how to deploy printers with group policy in Windows Server 2012 R2 because you won't be dealing with Windows Server 2012 R2 any longer. Enterprise print management would be a lot simpler if the only things that needed to be managed were printers. But, of course, that's not the case. Print management consists of both printer management and printer driver management, and it's the second of these two that ends up causing a ton of headaches. That's especially true when print servers are involved. The same innovative technology that makes these feats possible continues to evolve, and today it is bringing us a wealth of new apps with their own game changing. This is extremely an extraordinary post. Much thanks to you for sharing this exact pleasant post. Welcoming you to http://printersupportnumbercare.com/category/canon-printer-support/ The best place to fix printer related issues online without compromising any important work. No more waiting or staying in long ques for HP Printer Support because Customer Support Number is here to help you fix all in one place.